We’re happiest when you’re healthy at home. At Sunrise Skilled Nursing and Rehabilitation Center, we provide high quality skilled nursing and therapy care to ensure a superior level of rehabilitation for our guests. In addition to skilled nursing services 24-hours a day, we offer a team of rehabilitation specialists, offering physical therapy, speech and occupational therapy up to 7 days a week. We know choosing a health care and rehabilitation center for yourself or your loved one is one of the most important and difficult decisions you can make. You want someone who is caring, knowledgeable, and accessible. You want someone willing to take the time to go over all of your options. If you or a loved one are in need of health care, require advanced skilled nursing services and rehabilitation, then Sunrise Skilled Nursing and Rehabilitation Center is the choice for you. 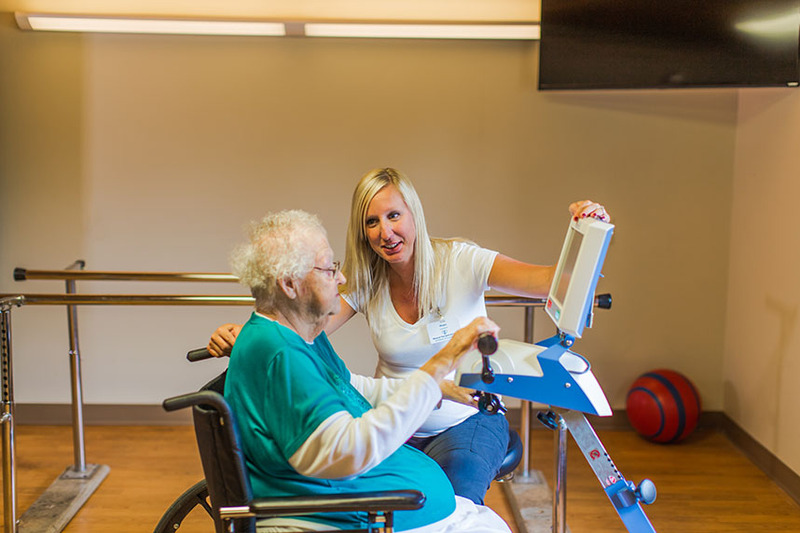 At Sunrise Skilled Nursing & Rehabilitation Center we believe that family deserves the best, so our Homeward Bound rehabilitation program combines cutting edge technology with proven therapeutic programs to get our residents to succeed and back home whenever possible. Our team of physical, speech, and occupational therapists encourage family involvement in our treatment plans for support and a truly personalized experience. Our Physical Therapy program focuses on identification, prevention and rehabilitation of individuals with physical impairment and pain. Following evaluation, the physical therapist develops an individualized treatment program addressing the areas of lower extremity strength, balance, coordination, functional movement, ambulation, endurance and general mobility. Our Occupational Therapy program addresses activities of daily living skills. The Occupational Therapist assists the patients in achieving their highest level of functioning, and in maximizing independence. Our Speech/Language Therapists provide a continuum of services including assessment, education and treatment of patients with communication, cognition and swallowing problems. Treatment programs are directed towards improving communication skills in the area of comprehension and expression. Patients admitted to the facility that are receiving nutrition partially or exclusively via a gastrostomy tube are evaluated for their potential to return to solid foods as appropriate. Such as FX2, OmniCycle, Diathermy, infra-red, Ultrasound, and E-Stim, promotes superior outcomes, optimizes functional gains, and increases discharges home. We can enhance patient tolerance to traditional therapies and start treatment earlier. We understand today’s senior is more active and selective than ever before. That’s why our Homeward Bound rehabilitation programs utilize the same technologies, protocols and practices as those of professional sports teams. Our licensed physical and occupational therapists have received specialized training in geriatric rehabilitation and modalities (method of treatment using state of the art technologies) in addition to all standard requirements in their field. These modalities are specifically designed to enhance the body’s ability to overcome a variety of traumas. Contact us today to find out more about what Sunrise Skilled Nursing and Rehabilitation Center can do for you! Sunrise Skilled Nursing and Rehabilitation Center offers skilled short-term and long-term care, 24-hours a day, under the supervision of our Medical Directors or your attending physician. We provide comprehensive skilled nursing care using state-of-the-art medical equipment and progressive treatment plans promoting quality care. Our mission is to promote the independence of our guests and the quality of their lives to the fullest extent. Guests of our centers, their family, and friends can rest assured knowing that our specially trained, dedicated professionals are providing quality care 24-hours a day. Assists residents and family members with adjustment to placement, discharge planning, for special concerns and needs. Individualized therapeutic diets, licensed dietician consultations available, special dietary needs. Residents enjoy restaurant style dining in the River Rock Cafe . Pharmacy services; laboratory, podiatry, optometry and hospice needs. Because we are, family serving families, we understand your needs and those of your loved one. The Alzheimer/Dementia residents need to be recognized and respected as an individual with unique needs and desires. At Sunrise’s Alzheimer and Dementia Care Unit, your loved one receives the highest quality specialized care from an interdisciplinary team of professionals. Our team is specifically educated and trained to understand and meet the individual needs of each Alzheimer resident – psycho-social, emotional, spiritual, physical, nutritional and medical needs. Alzheimer/Dementia resident needs to be supported in a manner that provides maximum independence and safety at every stage of the disease. Independence is stressed and encouraged at Sunrise Skilled Nursing and Rehabilitation Center. Residents are carefully monitored to determine their abilities as their disease progresses. They are allowed to function independently as long as possible. Our residents are assisted with various functions only when they are no longer able to perform them on their own. Contact us today to find out more about what Gilroy Healthcare and Rehabilitation Center can do for you! Covenant Care was founded in 1994 by healthcare professionals who wanted to create a company that would exceed customer expectations through quality care. We strive to provide complex, comprehensive and compassionate care in a safe and comfortable environment. Congratulations to Give Me 5 April Winner! Congratulations April Employee of the Month! © 2019 Covenant Care	| All Rights Reserved. We are Covenant Care California, LLC. We are not related to Covenant Retirement Communities.